The Gemfan 5152 has been specifically designed as a high-speed propeller. The inverse tip design helps to reduce blade tip vortex and the light weight of the propeller means it has a smaller moment of inertia and fast response time. Tags: Set of four, Gemfan, Flash, 5152-3, Propellers, Clear, CW, CCW, performance, durable, polycarbonate, props. 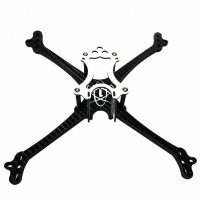 Space One FPV Aurora 5" X Introducing the Newest Racing Aircraft Frame Set from ..
Space One FPV Aurora 5" STRETCHIntroducing the Newest Racing Aircraft Frame Set ..